Lock in a great price for Hotel Amor y Paz - Adults Only – rated 8.8 by recent guests! You get Fruit, Yogurt and Bread for breakfast. It was good. We love the Hotel. The rooms are rustic and clean. The garden and patio is beautiful. They have a nice club on the weekends to relax and socialize. We would definitely stay here again. Rooms are warm and beds are very comfortable. Staff is very friendly. The hotel itself it's beautiful the rooms are cozy and very unique. Everything i was looking for peace,quite,clean,nice staff. Great, comfy hotel with tons of charm. Staff was wonderful. Will definitely stay here again. Great location. Absolutely beautiful. Very romantic. Very beautiful location. Staff was ready to help. Quite location. Amazing hotel and city near historical places. The staff were incredibly helpful and friendly. Very cosy place and an amazing terrace with great views. One of our top picks in Real de Catorce.Featuring a garden and a terrace, Hotel Amor y Paz - Adults Only is located in Real de Catorce. 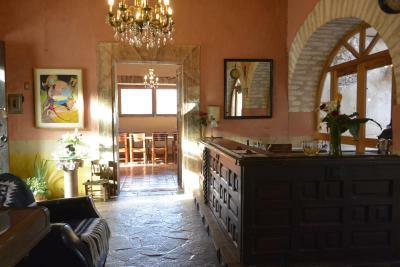 The property has a 24-hour front desk and free WiFi. At the hotel, rooms have a patio with a garden view. Rooms include a private bathroom and free toiletries, and some rooms include a balcony. The rooms have a closet. When would you like to stay at Hotel Amor y Paz - Adults Only? This double room features a balcony, view and tile/marble floor. House Rules Hotel Amor y Paz - Adults Only takes special requests – add in the next step! Hotel Amor y Paz - Adults Only accepts these cards and reserves the right to temporarily hold an amount prior to arrival. We had a small room. It was very very cold. We brought an electric blanket but still had trouble sleeping. I didn't like having to leave - and I cannot wait to return! As a single woman who travels alone for work, I generally stay in a lower-budget hotel. Every once in a while, I splurge on somewhere beautiful - and I am so glad I did. This hotel is tranquil and comfortable. As it was chilly when I was there, I was really impressed that every night I would work in the dining room, one of the fellows would bring in the heater. I never had to ask. Everyone at this hotel was helpful - right down to the fact that they had someone pick me up with my hundreds of boxes to drive me through the tunnel. The hotel is in a great location, and they have maps at the front desk. They sell beer and red wine, and they brought out dishes and milk at night so I could make my beloved cups of tea while I burned the midnight oil. The rooms are perfectly appointed with nice decor. I didn't have a desk in my room, but enjoyed the dining room anyway. In summer, it would be lovely to work in the courtyard. The room had ample plugs and general equipment - but even had full size kettles for making tea! (Be still, my beating heart!) My suggestions include some chilled white wine for those of us who can't drink red. I also would have opted for some Modelo Negra or something dark, over the Indio or Tecate! I also wondered why they didn't serve eggs with breakfast. The cream cheese on toast with fancy jelly was delightful, and the fruit was nice - but I did notice that none of the guests were eating the sliced tomatoes with cheese in the morning. I would have loved fried or scrambled eggs - simply because Real is chilly at this time of year, and it's nice to start the day with something hot, and a bit of protein. I also tend to work very late, and rise later than others - so wish the breakfast could have been served until 11 instead of 10 - but those are #firstworldproblems and are not reflected in my rating. You guys are doing an awesome job and I plan on bringing/sending you lots of business! The room smells a little bit of damp but I think is because of the construction with stones and the cold weather in the morning. Not a big issue for s few days. The room door didn’t close properly. Nights are cold there because of the wind that was not completely stopped by the door. They had this terrace full of towels being sun dried which just didn't look great. This is a small (about 20 room) hotel. We travel in a week day right after a long weekend holiday, so we were the only guests in the place. They won this thumbs up comment b/c the chef set up the breakfast table just for us and it was awesome. The breakfast hace some nice items but lacks options and variation. To Mexican norms, it gets a clear failing grade, certainly after three days of the same stuff. Noise isolation is poor, the bed on the floor above was squeaky. 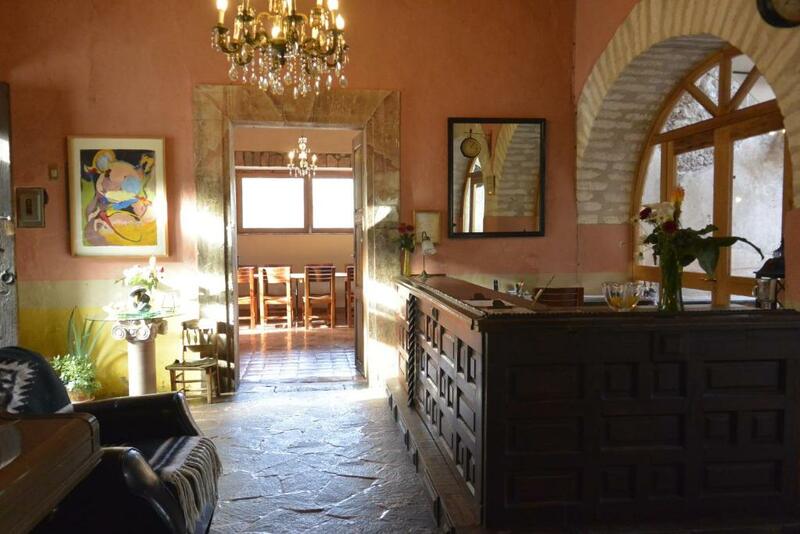 Classy old mansion in the hearth of Real de Catorce. There is a nice view from the rooftop terrace, although the terrace itself needs some attention. The room we got was small and no Heater so you need to ask for one. This year We took One and the room heated perfectly since the room was small. The bed was a bit to Firm. It is safe to park on the street outside the hotel, but traffic in the town will be very heavy (and parking very limited) if you arrive on a weekend. We had to park in the parking lot on the far side of town and move our car later.